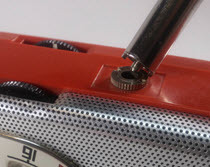 Battery holders are probably the Achilles Heel of old portable radios. 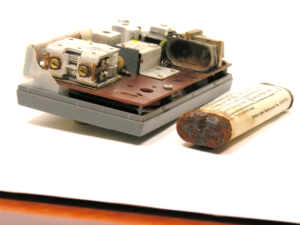 Old batteries were prone to leaking corrosive goo that forms an insulating insulator on the metal parts, preventing contact between the battery and terminals. Dirty or damaged terminals will silence a radio. Moisture, and especially exposure to salty sea air can add rust to the mix as well. the radio with it's metal cell holder illustrated here is an extreme example. Do I really need this radio to play? Am I willing to do other work if the battery issues end up being only part of the problem? Can I even reach the damaged battery contacts? Can I clean the contacts without destroying them? Can I buy or make metal parts or battery holders? To see if the radio will play once you fix the battery contact issue try temporarily connecting a known good battery or DC power supply using alligator clips to bypass the damaged metal. Be careful to match the set’s correct voltage and polarity if you try this. You might be able to clean existing contacts if most of the metal is still intact. Start by sanding or filing away the mess. A wire brush is helpful. A paste made from vinegar and baking soda can sometimes help loosen the crud. Paint the paste on with a toothbrush and let it stew for a while. Rinse off the cleaner carefully. Soaking contacts in CLR might work too.The potassium hydroxide in alkaline batteries is toxic. It can harm your eyes, damage skin and cause respiratory problems. When you clean up an alkaline battery leak, work only in a well-ventilated area. Wear eye protection and rubber gloves. When all else fails get out the Dremel and grind carefully. Don’t damage the plastic! Sometimes you will need to replace the contacts instead of just cleaning them. One of my favorite sources for replacement battery parts is Mouser.com. They carry a wide variety, including many items from Keystone, which if not always exact replacements, can often be modified to fit. Check them out. 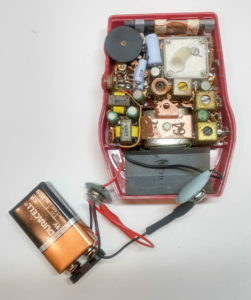 Many times, you will find radios with connectors that look like they are designed to fit today’s ubiquitous rectangular, 9-volt Batteries. Unfortunately, this is not always the case! 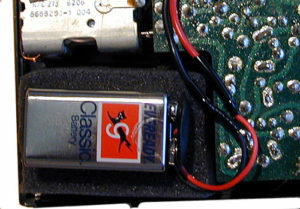 Sometimes those battery snaps in the radio were meant to plug into battery holders like the six-volt, four AA battery pack shown here. There are other holders with those same snaps that hold eight batteries providing 12 volts, and so forth. If you acquire a radio with 9-volt style snaps but no battery holder, do not assume the radio wants a rectangular 9-volt battery. It might want a holder like the one shown here, which provides only 6-volts. Or it might need a 12-volt, eight-cell holder. Without knowing the required voltage, you might provide a high enough voltage to damage the radio, or so low that the radio won’t play properly. 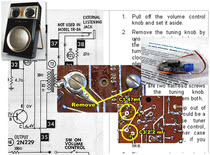 See if the label inside your radio provides any clues. If you have the user’s manual or service documentation, check these out. As a last resort search online for clues. RadioMuseum.org is a wonderful information source. Sometimes you need to get creative. Zenith and Sony, for example often made unusual holders. Replacements unavailable today. The battery tube in this tabletop set is crucial. They frequently disappear. 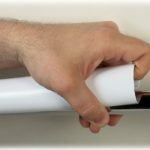 It turns out that the split plastic covers sold in hardware stores to protect shower curtain rods (like that one here) can be pressed into service. 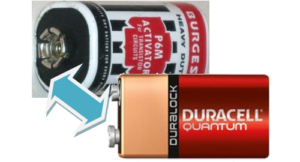 Many vintage radios and other collectible electronic items use small round 9-volt batteries or large, expensive 9-volt products. Fresh batteries like these are difficult or impossible to find and often cost quite a bit. You can purchase or make adapters like the ones I make and sell in my eBay store. 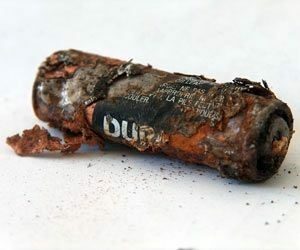 They enable you use inexpensive contemporary batteries instead of vintage reproductions. They provide 9-volts at the proper polarity for your radio or other devices. 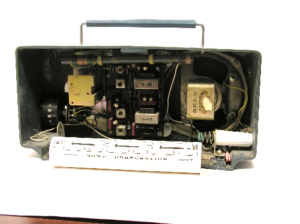 You might need to make minor modifications to the insides of some radios to make today's batteries fit. Sample instructions are included in the adapter kits I sell. The old round and big square batteries have contacts which are larger than the ones used today. Adapters must convert the large contacts to today's smaller at the proper polarity for your radio or other devices. 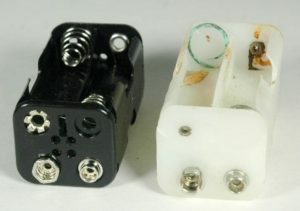 The large snap connectors used in these adapters are getting increasingly difficult to find. You might want to purchase more than one of these adapters or a supply of snaps while you can. Eveready 226, Neda 1600, Burgess P6M, Mallory M-1600, Philco P91, RCA VS300, Bright Star 0918, Marathon 1600A, Sears 6418 and 6421, Ward 62-96, Wizzard 7D7600, and Zenith Z226. Airline GEN1106A, GTM-1108A, GEN-1112A; Arvin 8576, 9577D; Astra STR-620; Aurora TPR-806; Capri TR600, TR700; Crown M600TR, TR-400, TR810; Excel MHT-6, 6T-2; General Electric PB815, PB816, PB30, PB831; Holiday BJB-6; Kikusui TR-602; Lifco Radio; Marveltone Radio; Motorola X14, X15; Onkyo TR-110; RCA 7BT9, 8BT7, 8BT8, 8BT9, 9BT9; Silverton Sears 211, 212, 213, 8204, 8206, 8208, 9202, 9203, 9204, 9205; Victor TA-2750; Westinghouse H587P7, H588P7, H589P7, H610P5, H611P5,H612P5, H617P7, H618P7,H619P7H651P6, H652P6,H653P6, H693P8, H694P8, H695P8; Yuko AK-100, AK-400, and others. 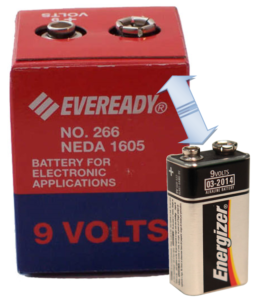 Eveready 266, NEDA 1600, Burgess P6M, Mallory M-1600, Philco P91, RCA VS300A, Ray-O-Vac 1600, Sears 6418 and 6421, Ward 62-96, Wizard 7D7600, and Zenith Z226 and others. Bulova 260 Series, Dewald L-414 and M-414, General Electric (GE) P805, P806, P807, P809, P815, P816, and Sonic TR-4, TR-500, TR-66. Neda 1610, Burgess 2Z3, Mallory M-1610, RCA VS324, and others. Regency TR-5C, TR-5B, TR-5C, TR-8A and others. The adapter shown here lets you use three, inexpensive, contemporary AAA batteries. 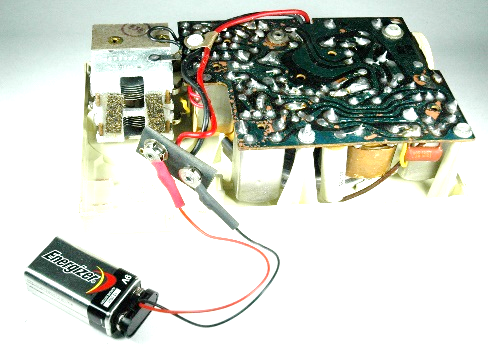 It provides 4.5-volts at the proper polarity for your radio or other devices. An On/Off switch protects the batteries and radio during adapter installation and removal. Sometimes, if you don't need to keep a radio "authentic" and have basic soldering skills you can just swap old large connectors with a contemporary 9-volt "snap" connector. 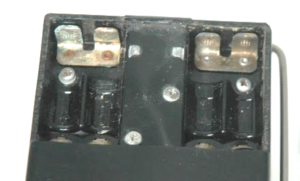 Either remove the radio and unsolder the old connector wires, or cut and splice the wires as shown here. Use shrink tubing or electrical tape to insulate the solder joints. Keep the old parts in case you want to restore the set to its original condition. she needs a 9 volt round battery. can they be found anywhere anymore? 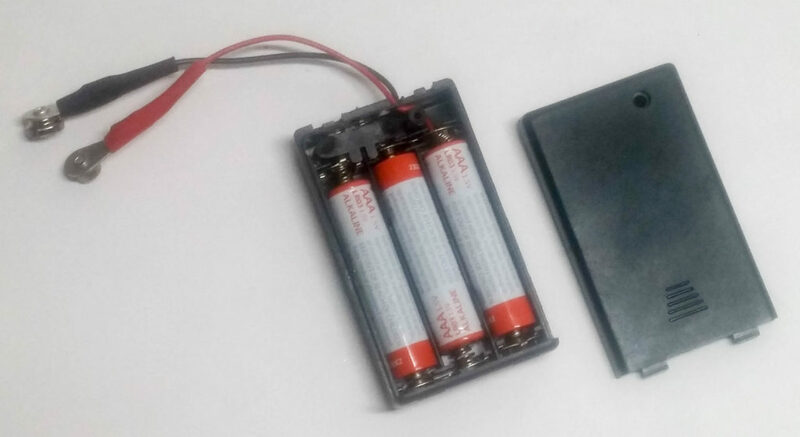 The “Battery Adapter Transistor Radios Play Again Neda 1600 P6M M-1600 P91 VS300 etc.” adapter in my eBay store should work.